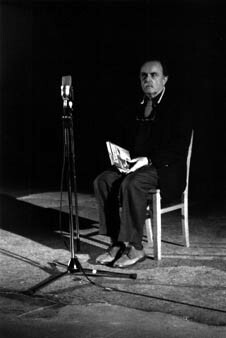 In this fascinating exploration of acoustical phenomena, Alvin Lucier slips from the domain of language to that of music in the course of 40 minutes and 32 repetitions of a simple paragraph of text. In I am sitting in a room, several sentences of recorded speech are simultaneously played back into a room and re-recorded there many times. As the repetitive process continues, those sounds common to the original spoken statement and those implied by the structural dimensions of the room are reinforced. The others are gradually eliminated. The space acts as a filter; the speech is transformed into pure sound. All the recorded segments are spliced together in the order in which they were made and constitute the work. I am sitting in a room was composed in 1970 and was first performed at the Guggenheim Museum in New York City that same year. A second version was made in 1972 to accompany the dance, Dune, performed by the Viola Farber Dance Company at the Brooklyn Academy of Music. Since that time, numerous versions of this composition have been realized in various ways by other musicians, including a Swedish radio broadcast version. This recording was made by Alvin Lucier on October 29th and 31st, 1980, in the living room of his home in Middletown, CT. The material was recorded on a Nagra tape recorder with an Electro-Voice 635 dynamic microphone and played back on one channel of a Revox A77 tape recorder, Dynaco amplifier and a KLH Model Six loudspeaker. It consists of thirty-two generations of Alvin Lucier's speech and was made expressly for Lovely Music, Ltd.